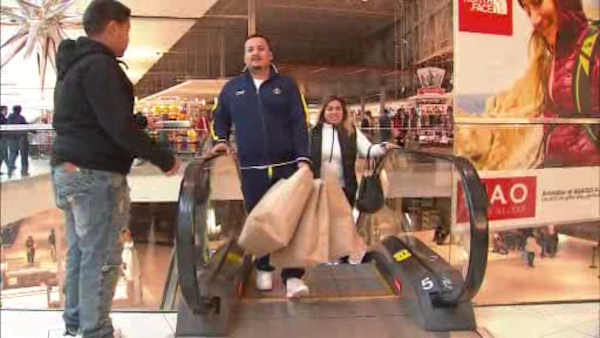 GUILDERLAND, New York -- A New York mall where panicked shoppers fled after gunshots were fired has reopened. The Crossgates Mall in Guilderland, New York, outside Albany was back in business at 11 a.m. Sunday. Authorities say witnesses heard one, possibly two, shots fired at about 2:30 p.m. Saturday. Hundreds fled, while shoppers and employees inside businesses were told to stay in place. A police helicopter flew overhead while investigators checked security cameras for clues they hoped would lead to suspects. The mall is one of the largest in New York, with 250 stores and restaurants. The gunfire was heard near the Apple store on the street level. More than 100 officers with assault rifles were deployed "because a shooter may still be in the mall," Police Chief Carol Lawlor said about six hours after the shooting. Witnesses told law enforcement authorities they heard one, possibly two, shots fired at about 2:30 p.m. near the Apple store on the street level, Lawlor said. Authorities with SWAT teams were searching for suspects into the night, the chief said. Police locked down the mall. Both shoppers and employees already inside businesses were instructed to shelter in place. A police helicopter flew overhead while investigators checked security cameras for clues they hoped would lead to suspects. They were examining footage that showed a man in a white shirt and black hoodie near the shooting scene. State Police Maj. Bill Keeler told the Albany Times-Union that reports suggested a possible confrontation between two men who fled. Mall management is working with authorities, Lawlor said, "and hopefully we'll bring this to a successful conclusion."